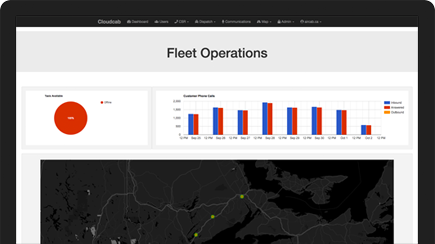 CloudCab is everything you need to operate a cab company in a box. Our easy to install and use hardware makes CloudCab an affordable and efficient taxi dispatching solution. Setup CloudCab at dispatch with as little as a laptop and an internet connection, or use it as a multi-monitor command post. The flexibility is yours. Setup each vehicle with an account and the provided CloudCab tablet. Designate zones that allow dispatch to automatically send closest available cabs to riders, making wait-times short and distribution fair. Automatically send ride requests to drivers allowing them to accept fares and collect payments all on their CloudCab tablet. Copyright 2018 Cloud Cab - All rights reserved.